As one of the first fashion bloggers, Kathryn has been profiled in The New York Times, Instyle, O Magazine, People Style Watch, Wall Street Journal, Essence Magazine, Redbook Magazine, Sister 2 Sister, and over 600 other print publications. 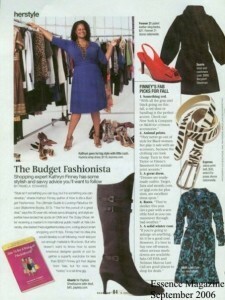 She’s also a contributor to Lucky Magazine, AOL, and Essence Magazine. Savvy MN Magazine Kathryn was on the October 2010 cover as well as the cover story for the Midwestern Women’s Magazine. 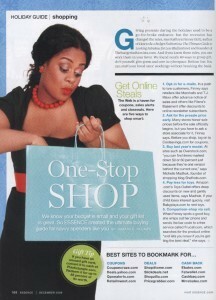 Redbook Magazine Kathryn discusses how she created The Budget Fashionista and turned the company into a successful business. Essence Magazine: Women of Style: Kathryn Finney Kathryn was select as a “Woman of Style” by Essence Magazine and featured in a full page article. New York Daily News: 13 Questions for a Fashion Blogger Two Page Profile of Kathryn Finney and her role as a leading blogger. San Francisco Chronicle. “LESS IS MORE- Hunting for Cheap Chic with a Fashionista as Guide.” 1000+ word article about Kathryn, the site, and her book. New Jersey Star Ledger: Shop, Blog and Rake it in: Hey, Why Didn’t I Think of That? (Front Page Article) A front page profile about Kathryn and Simply Good Media in New Jersey’s flagship newspaper. Woman’s World Weekly. “Kathryn Knows How to Bargain Shop.” Kathryn was profiled in a two page spread about her life, her site, and her book. E! Entertainment. “40 Crimes of Fashion”. E! Network: “The Look for Less/ America”™s Smartest Shoppers”.